When Donna joined the “Chin Chin” company, the company had been on the road since August, 1818, sixty-five weeks. The show had played from San Diego to San Francisco. It came to Decatur, Illinois, in October, 1919, and was the starting place to again cross the country, this time on a northern route to Seattle, Portland, and other cities in the Northwest. After the Decatur performance many of chorus girls left the company to go home for a vacation. New girls joined the company there and rehearsed between shows and were to go on with the principals for the trip west once more. There was one new principle with them, the woman who sang the part of the “Goddess of the Lamp.” That new principal was Donna Montran. NO SIX HOUR DAY HERE. “Coal miners who think that six hours a day, five days a week, constitute a week’s work should travel with one of these transcontinental companies, which make long jumps to make one and two night stands. “Donna Montran, who only recently joined the company as the leading soprano as the Goddess of the Lamp, lacked volume but the performance as a whole please the 2,600 people who saw it. In 1860, the Priest Hotel was built on the site, which some say was an ancient burial ground. The hotel’s name changed to the New Deming in 1880. It again changed name in 1892 to the “Decatur and Arcade Hotel.” The hotel burned in 1904. The hotel was rebuilt, but in 1915 it burned again. Two people were confirmed to have died in the second fire and several other people were missing, their bodies having never been found. After the 1915 fire, the site was rebuilt, this time into the Lincoln Square Theater. It was built with a fireproof intent using steel, cement, and fireproof brick. The theater hosted many celebrities of the time including Houdini and Ethel Barrymore. 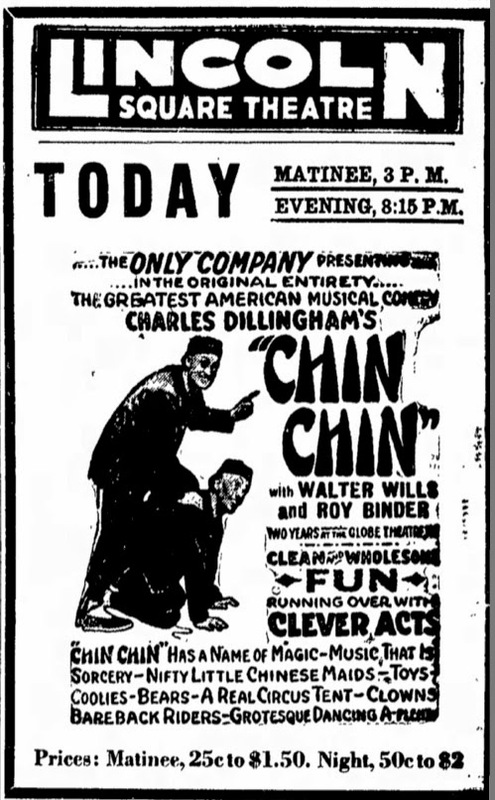 Jack Dempsey appeared there in the September before Donna and the Chin Chin company was there in October. Since the 1930s the theater has been considered haunted. The theater had a difficult time during the heyday of motion pictures and closed after December 1980, except for an occasional music show. It closed completely in 1990. However, also in 1990, Lincoln Square Theater, Inc., was established to determine the viability of saving the structure. Studies of the building found it to be sound and activities were undertaken to renovate and restore the facility. Several donations helped stabilize the building in the 1990s and in 2004, a $1.75M grant for restoration was received. Restoration began in 2005 and is currently ongoing. Despite the renovation and restoration the Lincoln Square Theater is still considered to be one of the most haunted theaters in the country. Troy Taylor has a regular tour of haunted places in Decatur which includes the Lincoln Square Theater. See http://www.haunteddecatur.com/ for details of his tours.